Types of Working Dogs: Truly Man's Best Friend! Although most people know that different types of working dogs exist, what they don't know is what exactly these dogs are capable of... if the general public did, they would see our canine friends in a much better light. Sure, "Fido, come" and "Fido, sit" are great commands and must have's in every owners' vocabulary. But do you even know the half of what your pooch is capable of? Buried in that furry head is keen intelligence, loyalty, and willingness to please - all needed for the immense tasks we have placed on the different types of working dogs. The first job that normally comes to mind when thinking about working dog breeds is guarding or watching. The difference? A guard dog will protect what it is trained to, while a watch dog will bark to "scare" away potential danger and alert their handlers to it. 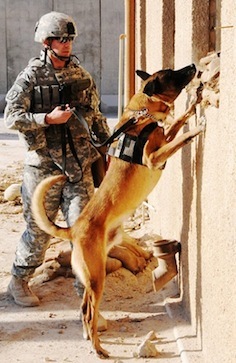 Today, this basic task is taken a few steps further, and working dogs are used for police work and the military. 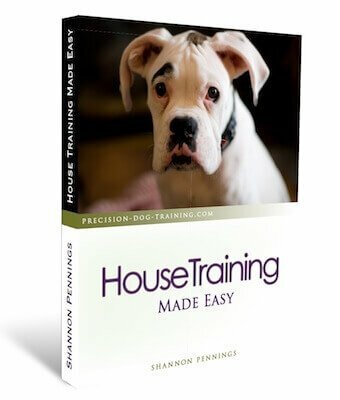 Personal protection dog training is really important in these lines of work. The most common breeds used are Malinois, German Shepherds, Dobermans, and Rottweilers. Sniffer dogs (detection or detector dogs) are trained to search for and detect drugs, currency, bombs, weapons, and agricultural products at airports, harbors, schools, businesses and postal services. Again, any size or breed of dog can be trained as a detector dog, but the most common breeds used for these types of working dogs are Labs, Beagles, German Shepherds and Belgian Malinios. While active indication used to be the most common way of training these dogs (scratching/barking at the source of the scent), passive indication (sitting in front of the source) is now the preferred method. Why? In airports and other public places, the dogs need to be able to safely mingle with passengers and other workers without causing a disturbance (scratching at people or baggage). Public perception of these dogs is very important! The interesting thing is, the dog is actually searching for his toy, not the drug! In training, the drug is placed inside of the dog's ball or other toy, so he associates the smell of the drugs with his favorite toy. Tracking dogs are used to find criminals and lost persons, both on land and in water. While German Shepherds, Belgian Malinois and other working breeds are used extensively for this job today, certain hounds can also be used to effectively track. In fact, Bloodhounds were the first breed to be used for human tracking. Here too, this type of working dog is not actually searching for humans per se, but his toy reward that magically pops up in front of him when he finds them. But this isn't the only use for working dogs! Hunting dogs have been used since ancient times, and are still employed today. They are trained to detect game, flush it out and retrieve for the hunter. 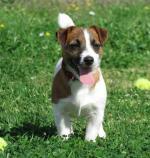 Included in this class of dog is the terrier and other small breeds, used for hunting vermin. Read more about the gun dogs and hound packs(coming soon). No doubt you've heard of search and rescue dogs , as stories are everywhere of lives that have been saved by a dog. Especially in Canada and other cold climate countries, they are used extensively in the mountains, snowy north and of course, the great Canadian Shield. Herding dogs have been used for centuries in protecting and helping herd sheep, goats, cows and ducks. These dogs must be tough, quick, intelligent and bold. Besides keeping the flocks together, they also have to be able to protect from predators, ranging from wolves and coyotes to poachers. One of the most well-known types of working dogs are the seeing-eye or dog guides. Specially trained from puppy-hood, these dogs guide their blind owners and keep them safe from danger. More recent still, the hearing-ear dog learns to alert their deaf owner when a phone rings, a car is coming, or to the sound of a fire alarm. Another type of service dog works for the physically disabled, helping them with daily tasks such as unloading the washing machine or getting in and out of bed. Lastly, although it isn't a "job", some dogs are used for visiting senior homes and hospitals. The companionship of a dog is so beneficial, even for the health of a human, that it is used as therapy, especially for long-term care patients. They are usually called therapy dogs. Click on the links you find in the above text to read more about the types of working dogs as well as different roles played in the training of working dogs! You can also sign up for "The Yellow Hydrant", a monthly selection of dog tips and techniques that is only for subscribers! Best part... it's totally free! To join the rest of the dog people, fill out the form below.